Rachel Von | The Journal Gazette Garrett's Clayton Fielden, top, overcame an ankle injury in his fourth match of the day to win his weight class at the New Haven Semistate. Clayton Fielden was on his way to a potential fourth pin of the day late Saturday afternoon when he felt – and everyone else heard – his ankle pop. Fielden, a Garrett junior searching for his first berth to the state finals, immediately thought ... well, we can't say exactly what Fielden thought in print. Fielden overcame his bum ankle as well as Rochester's Zane Gilbreath to claim a 9-6 decision and the championship at 170 pounds at the New Haven Semistate at Memorial Coliseum. In his first matches, Fielden needed only 1:56 in total time to pin his first three opponents, so having to work a little bit harder and overcome some pain was not a big deal. Fielden will vie for a state championship beginning at 6 p.m. Friday in Banker Life's Fieldhouse in Indianapolis. He will be joined by a bevy of other wrestlers from the area. Ethan Hicks of Carroll (152 pounds) and Huntington North's Charlie Agnew (195) each had four pins in sweeping their way to semistate titles. Agnew's Huntington teammate Preston Teusch (113), Logan Macklin of Adams Central (145), Bellmont's Jon Ruble (160) and Levi Leffers of Central Noble (220) also won semistate championships. 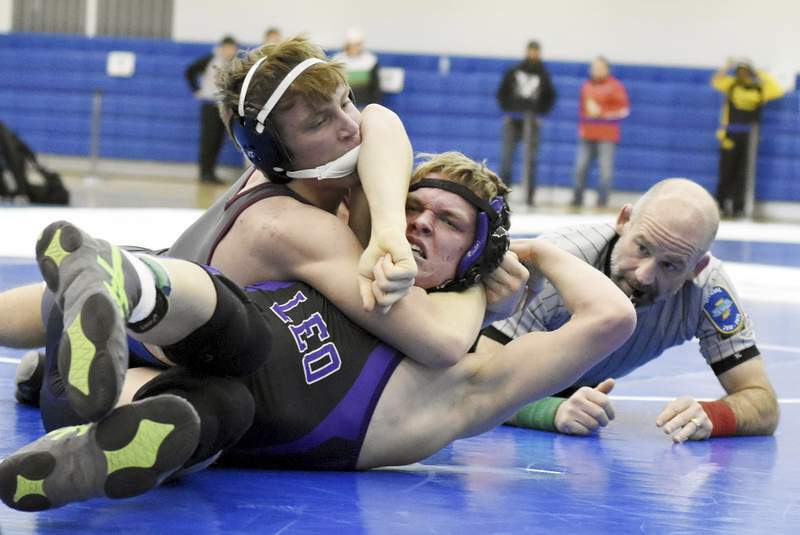 Five area wrestlers earned runner-up ribbons: Isaac Ruble of Bellmont (106), Norwell's Kade Zadylak (113), Logan Mosser of Adams Central (132), Jake Jenkins of Homestead (145) and Leo's Jaylen Elwood (220). A total of 28 areas wrestlers won at least two rounds to place in the top four in their weight class and earn a berth at the state finals. For the first time since 1992, Huntington North is sending four to Indianapolis as Cody McCune (152) and Christian Graft (220) joined Teusch and Agnew. The Vikings narrowly missed their first semistate team championship, finishing with 64 points, just behind first place Jimtown with 64.5. Yorktown, which had won six straight semistate titles, finished third, followed by Central Noble, Oak Hill, Carroll, Bellmont and Adams Central. The fact Agnew will have three teammates going with him to Banker's Life makes the dream even bigger. Carroll will send three to state, including Owen Krider (132) and Scottie Savoie (145), but no one had as seemingly easy a day as Hicks, a senior making his second straight trip to state. Hicks needed just 6:28 to win his four matches and the final match against Eric Hiestand of Yorktown was over in 1:37. Carroll coach Tim Sloffer was equally surprised at the quickness of Hick's semistate path to state. The IHSAA will announce the state pairings at 4 p.m. today.